Restaurant.com is offering $10 restaurant gift certificates for $2! To get this deal, use coupon code TREAT at checkout. This is a great way to save on dinner out, so go ahead and find the participating restaurants in your area. You can also check for restaurants in other areas that you plan to travel to in order to save on meals during a trip too. 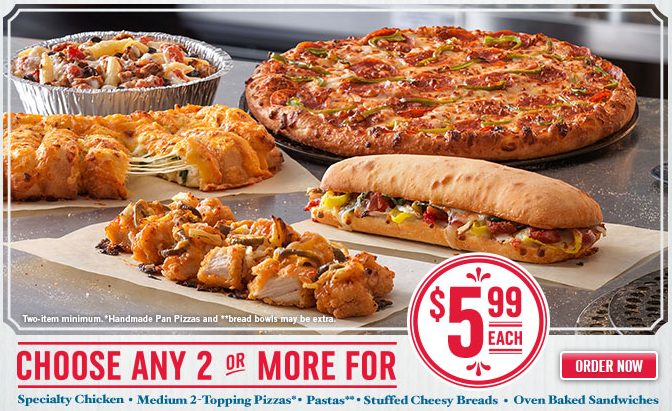 Also, if you’re looking for another dining deal, Dominos Pizza is offering the carryout all large 2-topping pizzas for $5.99 each, all week through 5/3. There is no coupon code necessary, so choose your favorite toppings and order for an affordable pizza night!